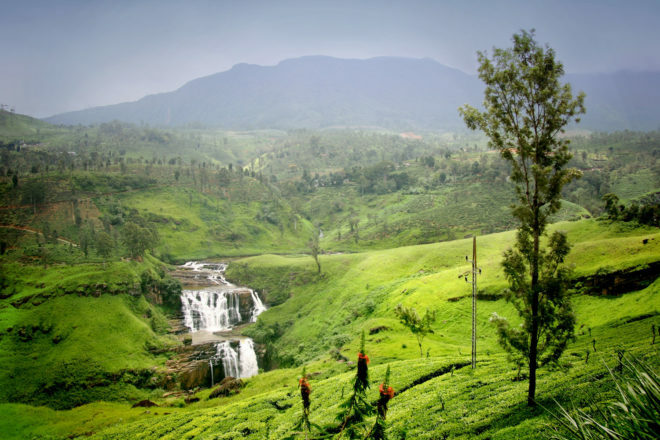 Sri Lanka is home to more than 100 waterfalls and rivers, most of which are located in the Hill Country. While some of the waterfalls are manmade, they’re still breath-takingly beautiful. Admittedly, due to the dense forests that surround them, only a handful of waterfalls are actually accessible to swim in. Among the easier ones to visit is Dunhinda Waterfalls, situated two kilometres off the main road that leads to Taldena. Famous for its misty spray that falls down along stones, it’s as beautiful as it is relaxing to take a dip in. Ramboda Falls in Pussellawa is another easy option – surrounded by several holiday resorts that make it ideal for a family holiday. There’s actually two main drops here, but most visitors aren’t aware of the upper drop. Or if you’re feeling more adventurous, Bambarakanda Waterfalls is the tallest known waterfall in Sri Lanka, towering 240 metres. If you can’t make the journey to this giant waterfall, you can catch a glimpse of it on the way to Haputale. 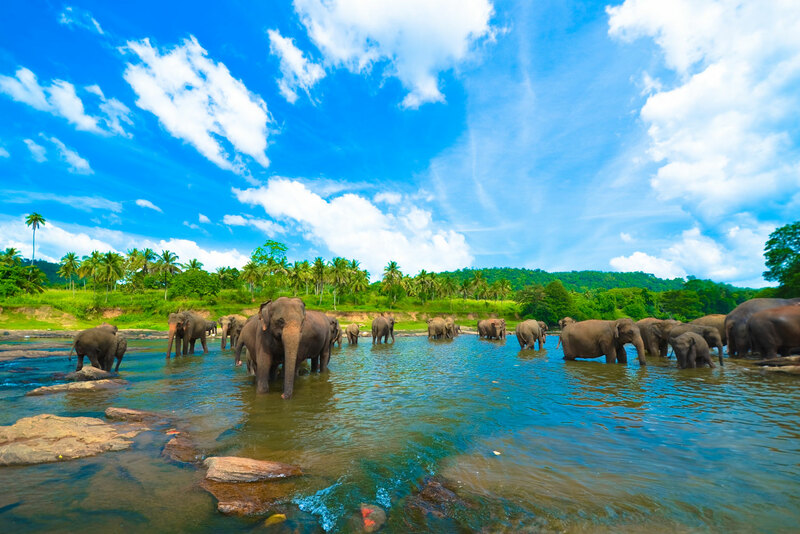 Though Sri Lanka is quite a small island nation, it is one of the world’s most biodiverse hotspots. Home to more than 90 species of mammals and 3200 species of flowering plants, it boasts an extensive list of unique wildlife. Among the best places to see the local flora and fauna is Yala National Park, where you can come up close with untamed wildlife. Another is Wilpattu National Park, home to 30-odd species of mammals including the Sri Lankan elephant, Sri Lankan leopard, Sri Lankan sloth bear, spotted deer, buffalo, sambar and mongoose. Suffice to say, it’s a memorable experience for avid nature lovers and first-time visitors alike. As one of the most valuable and historical monuments of Sri Lanka, Sigiriya is referred to by locals as the Eighth Wonder of the World, and ranked #86 in our countdown of ‘100 Ultimate Travel Experiences of a Lifetime’. This ancient palace and fortress complex attracts thousands of travellers every year, making it one of (if not the) most iconic tourist destination in Sri Lanka. Adding to the palace’s archaeological significance is its location, perched on a massive rocky plateau 370 meters above the sea level, in the heart of the island between the towns of Dambulla and Habarane. 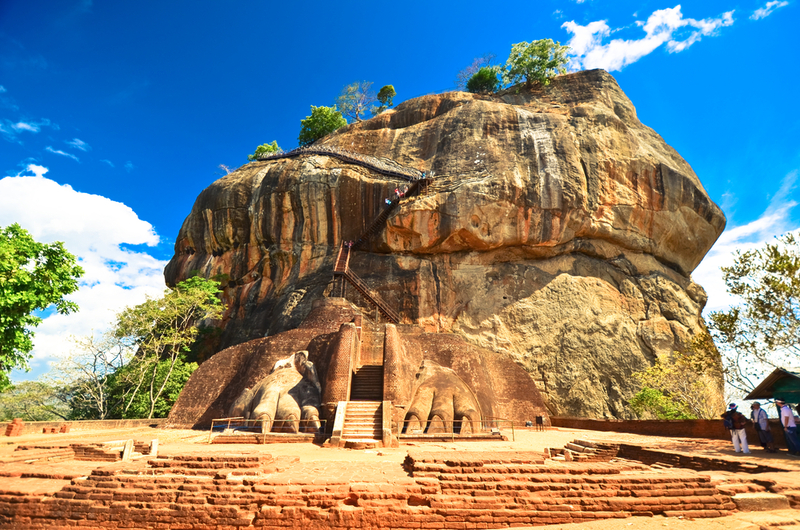 Sigiriya rock plateau is 200 meters higher than the surrounding jungles (formed from the magma of an extinct volcano), making for an impressive viewpoint over the area. Once you’ve ticked Sigiriya off your bucket list, some 90 kilometres south in the city of Kandy is The Temple of the Sacred Tooth Relic. This revered Buddhist temple lies in in the royal palace complex of the former Kingdom of Kandy, which houses the relic of the tooth of the Buddha. Since ancient times, the relic has played an important role in local politics because it is believed that whoever holds the relic holds the governance of the country. Sri Lanka’s rich and vast cultural diversity is a cornerstone of the country’s identity. With unique customs and rituals dating back over 2000 years, the most prominent feature of the Sri Lankan culture is its colourful festivals, which are a major drawcard for travellers. Religion also plays an important role in moulding the local culture and traditions. Among the most important events that you can attend is the Sinhala and Tamil New Year festivals in April, where people, young and old, take part in religious celebrations as a thanksgiving for a year of bountiful harvest. Everyone wears their best dress for the festivities, in which traditional Sri Lankan food is shared by family members and visiting relatives. Meanwhile the May Full Moon Poya Day or Vesak is the most important religious celebration in Sri Lanka, where Buddhists celebrate the nativity, enlightenment and passing away of Lord Buddha. Surrounded by the ocean and over 1000 kilometres of palm fringed golden coastline, Sri Lanka boasts of some of the finest and most picturesque beaches in the world. 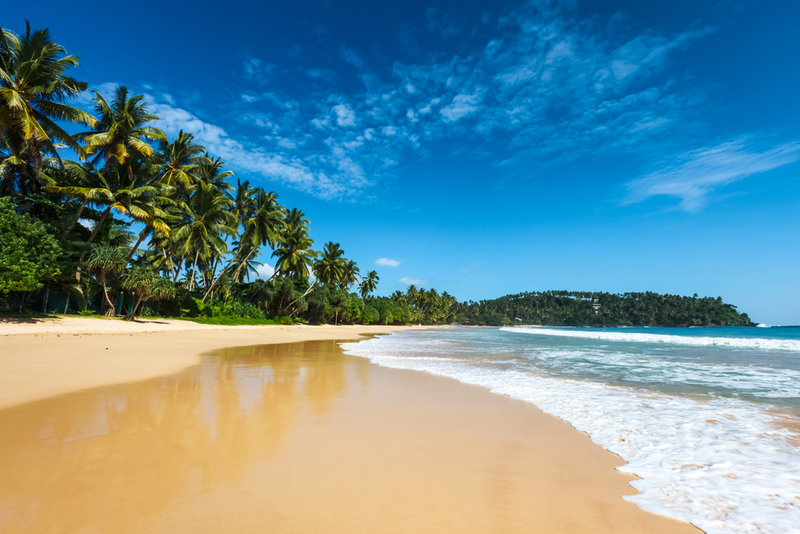 Better still, Sri Lanka is a year-round beach destination; when the north-east monsoon wind blows from November to March, one can enjoy the sunny and calm beaches in the western and southern coastline. During the south-west monsoon season from April to October, the attractive beaches of the east, considered among the best in the world, are ready to be enjoyed. Known as the ‘pearl of the Indian Ocean’, Sri Lanka is piquing the interest of more and more travellers, and for good reason. Here we reveal the essential experiences every Sri Lankan itinerary should include. In a country draped in lush forests and surrounded by tropical waters, adventure seekers will be spoiled for choice when it comes to outdoor activities. Diving, scuba diving, snorkelling and surfing are all popular pastimes for water-loving visitors, as is canoeing, wind surfing and fishing. Though Sri Lanka is quite a small island nation, it is one of the world’s most biodiverse hotspots. Home to more than 90 species of mammals and 3200 species of flowering plants, it boasts an extensive list of unique wildlife. Among the best places to see the local flora and fauna is Yala National Park, where you can come up close with untamed wildlife. Another is Wilpattu National Park, home to 30-odd species of mammals including the Sri Lankan elephant, Sri Lankan leopard, Sri Lankan sloth bear, spotted deer, buffalo, sambar and mongoose. Suffice to say, it’s a memorable experience for avid nature lovers and first-time visitors alike. Sri Lanka’s rich and vast cultural diversity is a cornerstone of the country’s identity. With unique customs and rituals dating back over 2000 years, the most prominent feature of the Sri Lankan culture is its colourful festivals, which are a major drawcard for travellers. Religion also plays an important role in moulding the local culture and traditions. Among the most important events that you can attend is the Sinhala and Tamil New Year festivals in April, where people, young and old, take part in religious celebrations as a thanksgiving for a year of bountiful harvest. Everyone wears their best dress for the festivities, in which traditional Sri Lankan food is shared by family members and visiting relatives. Meanwhile the May Full Moon Poya Day or Vesak is the most important religious celebration in Sri Lanka, where Buddhists celebrate the nativity, enlightenment and passing away of Lord Buddha. As one of the most valuable and historical monuments of Sri Lanka, Sigiriya is referred to by locals as the Eighth Wonder of the World, and ranked #86 in our countdown of ‘100 Ultimate Travel Experiences of a Lifetime’. This ancient palace and fortress complex attracts thousands of travellers every year, making it one of (if not the) most iconic tourist destination in Sri Lanka. Adding to the palace’s archaeological significance is its location, perched on a massive rocky plateau 370 meters above the sea level, in the heart of the island between the towns of Dambulla and Habarane. Sigiriya rock plateau is 200 meters higher than the surrounding jungles (formed from the magma of an extinct volcano), making for an impressive viewpoint over the area. Once you’ve ticked Sigiriya off your bucket list, some 90 kilometres south in the city of Kandy is The Temple of the Sacred Tooth Relic. 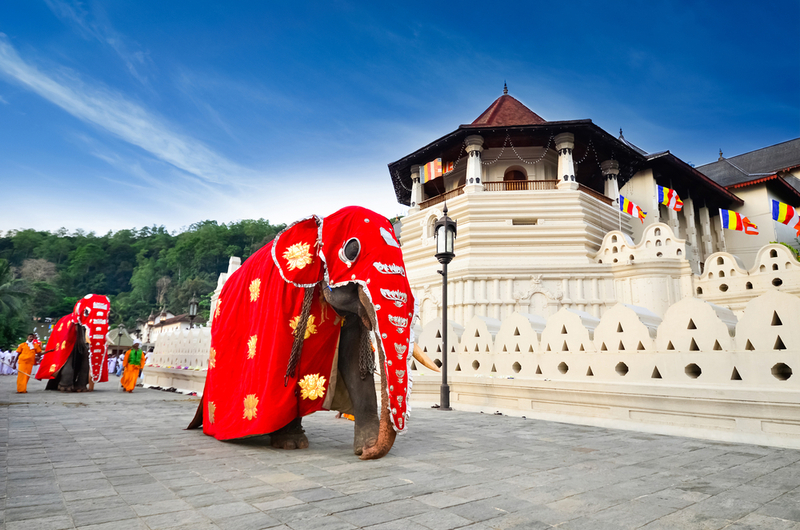 This revered Buddhist temple lies in in the royal palace complex of the former Kingdom of Kandy, which houses the relic of the tooth of the Buddha. Since ancient times, the relic has played an important role in local politics because it is believed that whoever holds the relic holds the governance of the country. Surrounded by the ocean and over 1000 kilometres of palm fringed golden coastline, Sri Lanka boasts of some of the finest and most picturesque beaches in the world. Better still, Sri Lanka is a year-round beach destination; when the north-east monsoon wind blows from November to March, one can enjoy the sunny and calm beaches in the western and southern coastline. During the south-west monsoon season from April to October, the attractive beaches of the east, considered among the best in the world, are ready to be enjoyed. Sri Lanka is home to more than 100 waterfalls and rivers, most of which are located in the Hill Country. While some of the waterfalls are manmade, they’re still breath-takingly beautiful. Admittedly, due to the dense forests that surround them, only a handful of waterfalls are actually accessible to swim in. Among the easier ones to visit is Dunhinda Waterfalls, situated two kilometres off the main road that leads to Taldena. Famous for its misty spray that falls down along stones, it’s as beautiful as it is relaxing to take a dip in. Ramboda Falls in Pussellawa is another easy option – surrounded by several holiday resorts that make it ideal for a family holiday. There’s actually two main drops here, but most visitors aren’t aware of the upper drop. Or if you’re feeling more adventurous, Bambarakanda Waterfalls is the tallest known waterfall in Sri Lanka, towering 240 metres. If you can’t make the journey to this giant waterfall, you can catch a glimpse of it on the way to Haputale. Sri Lanka is synonymous with fine tea and among the best places to sample it is at the Labookellie Tea Centre. A renowned landmark for both locals and visitors to Nuwara-Eliya, this tea centre has recently been expanded and refurbished. Here you can participate in a free guided tour of the Labookellie tea factory and an educational experience in tea cultivation and manufacturing. Alternatively about 40 kilometres away is the Mlesna Tea Castle, which is one of the most exquisite tea houses located at St Clair’s Falls. Renowned for their presentation of tea in delicate packaging, Mlesna operates a few specialty tea houses in Sri Lanka, providing visitors a cup of refreshing, properly brewed, tea in many different flavours. A small port town largely supported by its centuries-old fishing industry, Negombo is a taste of yesteryear in Sri Lanka. With bustling fish markets, sandy beaches and a 100-kilometre-long canal running through the town that is still used, Negombo showcases Sri Lankan in a different light. And, with an abundance of fresh seafood available, it’s also a haven for food lovers. For more information on planning your travels to Sri Lanka, contact 21st Century Tours.